1		Stainless Steel Table, 7'x 2'. 2		Stainless Steel Table, 7'x 2'. 3		Stainless Steel Topped Trough, 5'x 4'. 4		Stainless Steel Handwash Sterilizer. 5		Stainless Steel Personnel Handwash, 5'. 6		Stainless Steel Offal Rack, 8'. Stainless Steel Mesh Insert Base. 8		Stainless Steel Topped Trough, 8'x 3'6". 9		Stainless Steel Topped Trough, 8'x 3'. 12		Stainless Steel Topped Table, 8'x 5'. 13		Gravity Roller Conveyor, 20'. 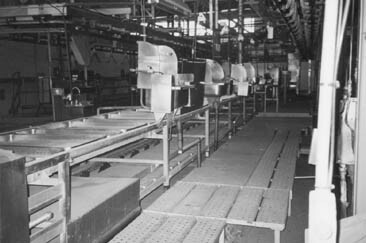 14		Gravity Roller Conveyor, 20'. 15		Galvanised Pipe Wal Rack, 30'. 17		Stainless Steel Chutes, 24" x 30'. 18	10	Sealed Fluorescent Lights. 19	2	Exhaust Fan, 24". 20		FDC, 2 Fan x 30". 21		Stainless Steel Table, 8'x 2'. 22		Stainless Steel Handwash Sterilizer. 26	1500	Approx Cardboard Offal Cartons. 27		"Conditionaire" Air Curtain, 3'. 28		"Conditionaire" Air Curtain, 4'. 29		"Conditionaire" Air Curtain, 6'. 20'x 32' and Roller Shutter. 31D		"Wolfking" Mincer, 5in Throat. 32		Suspended Meat Rail, 7 x 25' & 10 x 25'. 33		Hose Stand and Hose. 34	16	Poly Tubs, 230 Litre. 35		Styrene Chiller Door, 6'x 6'6". 36	6	Sealed Fluorescent Lights. 37		Styrene Ceiling, 30'x 30'. 38		Styrene Chiller Door, 7'x 6'6". Shutter Door, Meat Rail and "Tieman" Bump Pad. Bin Lifter and Product Dump Bin. 41	5	Assorted Expanded Mesh Perforated Wash Stands. 41C		Stainless Steel Tub, 1.5m x 1.5m x .75m with Legs. 41D		Stainless Steel Tub, 1.5m x 1.5m x .75m with Legs. 41E		Stainless Steel Tub, 1m x .4m. 41F		Stainless Steel Mobile Dump Bin, 1m x 1m x 1m. 41G		Stainless Steel Mobile Dump Bin, 1m x 1m x 1m. 41H		Stainless Steel Mobile Tub, 2m x 1m x 1m. 41J		Stainless Steel Mobile Tub, 2m x 1m x 1m. 41K		Stainless Steel Mincer, Model 51. 41M		Stainless Steel Table, 3m x .5m. 41N		Stainless Steel Table, 2.5m x 1.5m. 41P		Stainless Steel Table, 2m x 1m. 41Q		Stainless Steel Table, 2m x 1m. 41R		Stainless Steel Table, 2m x 1m. 41S		Stainless Steel Table, 2m x 1m. 41T		Stainless Steel Table, 3m x 1m. 41U		Stainless Steel Handwash Sterilizer. 41V		Stainless Steel Handwash Sterilizer. 41W		Stainless Steel Insulated Vat, 2m x 1m x 1m. 41X		Stainless Steel Pickle Injector, 23 Needle. 41Y		Stainless Steel Pickle Injector, 23 Needle. 41Z		"Barnes Challenge" Stainless Steel Meat Bandsaw. 42		"Conditionaire" Air Curtain, 4'. Landing Stage and Anchor Motorised Winch. 44	2	Stainless Steel Handwashes. 47		Styrene Partition, 30'x 20'. 48		Small Stock Restrainer, 30', Poly Slat. Sterilizer and Wall Fan, 24". 52		Aluminium Checker Plate Work Platform, 40'x 6'. 55	4	Stainless Steel Handwash Sterilizers. 62	2	Stainless Steel Handwash Sterilizers. with Stainless Steel Handwash Sterilizer. 64		Perforated Metal Wash Stand, 15'x 15', Irregular. 66		Small Stock Chain, 350'. 67	2	Stainless Steel Chute Heads and Wash Basin. 68		Stainless Steel Trommel Wash, 3'x 12". 69		Stianless Steel Handwash Sterilizer. 70		Stianless Steel Handwash Sterilizer. 71		Stianless Steel Handwash Sterilizer. Headwash Trough, 20' with 5' Splashback. 74		Stainless Steel Handwash Sterilizer. 75	3	Stainless Steel Handwash Sterilizers. 20'x 4' with Stainless Steel Sink. 30'x 4' and Expanded Mesh Stairway. 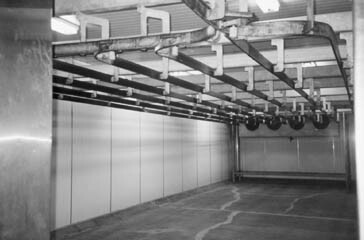 80A	4	Girder Trollerys and RSJ, 10'. 82	3	Stainless Steel Wash Basins, Table Frame, etc. 86		"Morris" 1/2 Ton Chain Hoist. 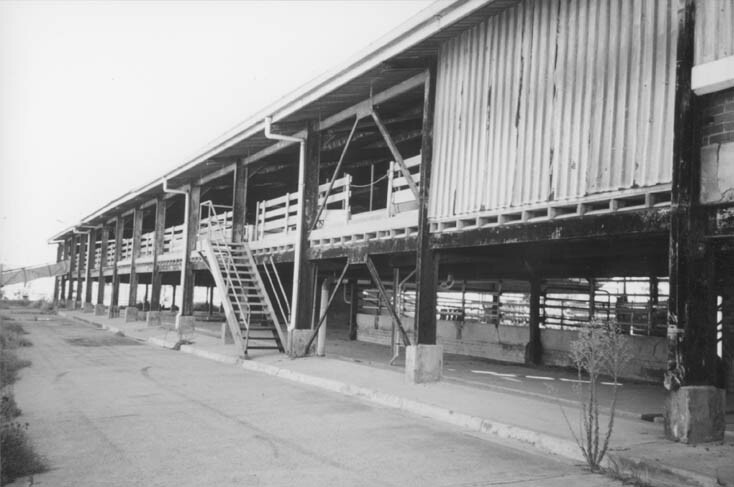 88		Suspended Meat Rail, 7 x 30' & 9 x 80'. 89		FDC Unit, 3 Fan x 30". 90		FDC Unit, 3 Fan x 30". 91		FDC Unit, 3 Fan x 30". 92		FDC Unit, 3 Fan x 30". 93		FDC Unit, 3 Fan x 30". 94		FDC Unit, 3 Fan x 30". 95	3	Aluminum Checker Plate Work Platforms. 96		Styrene Freezer Door, 6'x 12'. 97		Styrene Freezer Door, 6'x 12'. 98		"Toledo" Rail Dial Scale, 600kg x 1kg. 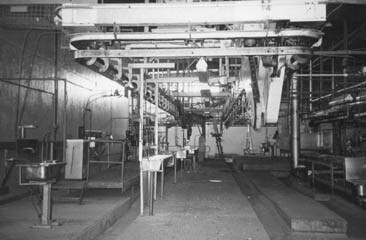 99		Suspended Meat Rail, 26 x 27' & 100' on Corridor. 100	18	Sealed Fluorescent Lights. 101A		Galvanised Pipe Hand Rail, 30'. 102		Styrene to Cut, 30'x 10' & Ceiling 6'x 30'. 103		Suspended Meat Rail, 8 x 45'. 104	2	FDC Units, 3 Fan x 18". 105	6	Sealed Fluorescent Lights. 106		Styrene, 50'x 16' and Ceiling. 107		Suspended Meat Rail, 8 x 45'. 108	2	FDC Units, 2 Fan x 18". 109	5	Sealed Fluorescent Lights. 110		Styrene, 50'x 16' and Ceiling. 111		Styrene Chiller Door, 6'x 7'. 112	5	Chiller Doors, 6'x 7'. 113		Suspended Meat Rail, 8 x 50'. 114	2	FDC Units, 3 Fan x 18". 115	6	Sealed Fluorescent Lights. 116		Styrene Chiller Door, 6'x 12'. 117		Styrene Chiller Door, 6'x 12'. 118		Freezer Door, 6'x 12'. 119		Suspended Meat Rail, 8 x 40'. 120	2	FDC Units, 4 Fan x 18". 121	5	Sealed Fluorescent Lights. 123		Styrene Freezer Door, 5'x 8'. 124		Styrene Freezer Door, 5'x 8'. 125		Meat Rail, 30', Quartering Rail and Lowerator. 126		Stainless Steel Sheet, 15' x 5'. 127		Styrene Freezer Door, 5'x 7'. 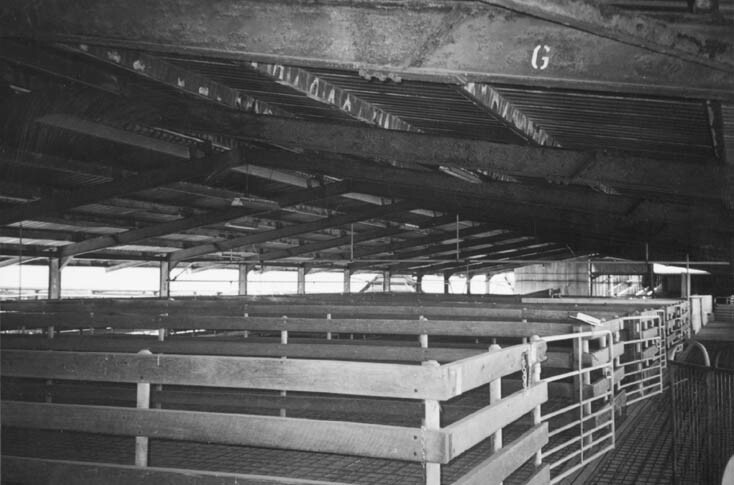 128		Suspended Meat Rail, 2 x 13 x 15'. 129	2	FDC Units, 4 Fan x 15". 130	4	"Prestage"  Fluorescent Lights. 131		Suspended Meat Rail, 8 x 50'. 132		FDC Unit, 3 Fan x 15". 133	3	Sealed Fluorescent Lights. 134		Styrene Ceiling, 50'x 17'. 135		Styrene Chiller Door, 5'x 12'. 136		Suspended Meat Rail, 8 x 50'. 137	2	FDC Units, 3 Fan x 24" (Floor Mounted). 138	4	Sealed Fluorescent Lights. 139		Freezer Door, 5'x 10'. 141		FDC Unit, 2 Fan x 18". 142		Steel Clothes Locker, Stationery Cabinet. 144		Suspended  Meat Rail, 8 x 40'. 145		FDC Unit, 4 Fan x 18". 146	6	Sealed Fluorescent Lights. 147		Styrene Structure, 50'x 16' and Ceiling. 148		Styrene Chiller Door, 5'x 9'. 149		Suspended Meat Rail, 8 x 40'. 150		FDC Unit, 4 Fan x 18". 151	6	Sealed Fluorescent Lights. 152		Styrene Structure, 50'x 17' and Ceiling. 153		Styrene Chiller Door, 5' x 9'. 154		Suspended Meat Rail, 8 x 40'. 155	2	FDC Units, 4 Fan x 18". 156	4	Sealed Fluorescent Lights. 157		Styrene Chiller Door, 6'x 9'. 158		Suspended Meat Rail, 7 x 20'. 159	2	"Muller" FDC Units, 3 x 15". 160	4	Sealed Fluorescent Lights. 161		"Toldeo" Rail Dial Scale, 600kg x 1kg. 163		Wire Mesh Cage, 6'x 8'. 165		Styrene Freezer Door, 6'x 9'. 166		Pair See Thru Doors. 167		Pair See Thru Doors. 168	3	Carton Stillages, 4'x 3'6" x 5'9", 8 Shelf. 2 Carton Stillages, 4'x 3'6" x 5'9", 3 Shelf. 169		Blast Freezer FDC Unit, 36" Fan. 170		Blast Freezer FDC Unit, 36" Fan. 171	2	Blast Freezer Doors, 6'6" x 6'6". 172		Suspended Meat Rail, 9 x 20'. 173	3	Freezer Coils, 12'x 4' with 12 FDC Fans, 24". 174	6	Sealed Fluorescent Lights. Ceiling, 40'x 30' and Wall 30'x 10'. 176	3	FDC Units, 2 Fan x 18". 177	6	Sealed Fluorescent Lights. 178	16	Carton Stillages, 4'x 3'x 5'9", 8 Shelf. 179	16	Carton Stillages, 4'x 3'x 5'9", 4 Shelf. 180		Styrene Freezer Door, 6'x 12'. 182		Styrene Loadout Dock, 27'x 14'x 10', "Tieman"
183		Stainless Steel Handwash Sterilizer. 184		Styrene Chiller Door, 7'x 9'. 186		Motorised Roller Shutter Door, 25'x 15'. 187		Motorised Roller Shutter Door, 25'x 15'. 188		Motorised Roller Shutter Door, 12'x 15'. 188A		Stainless Steel Vat, 2m x 1m x 1m, Two Well. 188B		Stainless Steel Tub, .75m x .5m x .2m. 188C	3	Stainless Steel Table Tops, 2m x 1.5m. 188D	5	Stainless Steel Table Tops, 1.5m x .75m. 188E	2	Stainless Steel Pans, 1m x .2m x 15cm. 188F	4	Stainless Steel Clad Fluorescent Lights. 188G		See Thru Curtain Strip. 188K	5	Galvanised Stillages, 4'x 3', 2 Shelf. 188L	4	Galvanised Stillages, 4'x 3', 2 Shelf. 188M		Galvanised Stillage, 4'x 3', 5 Shelf. 188N		Galvanised Stillage, 4'x 3', 4 Shelf. 189D		Stainless Steel Topped Table, 1.5m x 1.5m. 189E		Stainless Steel Topped Table, 2m x 2m. 189F		Stainless Steel Topped Table, 2m x 2m. 189G		Stainless Steel Topped Table, 2m x 1.5m. 189H		Stainless Steel Sausage Table. 189J		Stainless Steel Sloped Table, 1.5m x 1.5m. 189K		Stainless Steel Tank, 2m x 1m. 189L		Stainless Steel Tank, 2m x 1m. 189P	15	Plastic Meat Tubs. 189Q	11	Plastic Meat Tubs. 189R	9	Round Plastic Meat Tubs. 189S	120	Stainless Steel Bacon Rakes. 189T	100	Leg Ham Presses. 189U		Assorted Chrome Steel Meat Hooks. 189X	5	Stainless Steel Table Tops, 1.5m x 1.5m. 189Y	10	Stainless Steel Inset Lights. 190		See Thru Curtain, 5'x 7'. 191		Stainless Steel Personnel Handwash, 2 Station. 192		"Nolex" Supercut Stainless Steel Bandsaw, 18"
196		Fat and Bone Belt Conveyor. 197		Stainless Steel Topped Table, 6'x 4', 3" Lip. 198		Stainless Steel Topped Table, 6'x 4', 3" Lip. 199		Stainless Steel Personnel Handwash, 3 Station. 200	3	FDC Units, 2 Fan x 15". 202		Boning Rail 21 Station. 203	32	Sealed Fluorescent Lights. 205		"Chubb" Strong Room Door. 208		Styrene to Office, 8' and Styrene Bench, 8'. 209		Pallet Racking, 20 Pallet. 210	250	Approx Cardboard Mutton Cartons. 211	2	Carton Stands, 10'x 4' & 7'x 4'. 212		Stainless Steel Topped Table, 8'x 5'. 212A		Offal Vertical Plate Freezer. 212B		Offal Vertical Plate Freezer. 212C		Offal Vertical Plate Freezer. 212D		Offal Vertical Plate Freezer. 212E		Offal Vertical Plate Freezer. 212F		Offal Vertical Plate Freezer. 212G		Offal Vertical Plate Freezer. 212H		Offal Vertical Plate Freezer. 212J		Offal Vertical Plate Freezer. 212K		Offal Vertical Plate Freezer. 212L		Offal Vertical Plate Freezer. 212M		Offal Vertical Plate Freezer. 212N		Offal Vertical Plate Freezer. 213		"Sharples" 1200 Blood Ring Dryer. 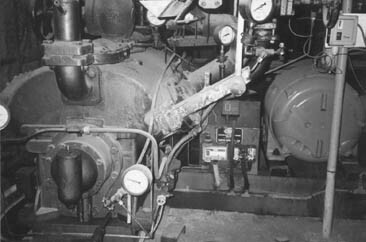 213B		"Tomlinson" 400hp Gas Fired Package Boiler. 214		"Trevor" 280hp Boiler, Gas Fired. 216		"Stamp" 48" Prebreaker, 75hp. 217		"Frilec" Prebreaker, 36", Model 2P681. 221		"Atlas Copco" V4 Air Compressor, 75kw Motor. 221B		"Atlas Copco" 8 Cylinder Compressor, Type DT2. 223	40	Bays Pallet Racking. 224		"Safe Seal" Bung Inserter. 226A	10	Assorted Styrene Doors. 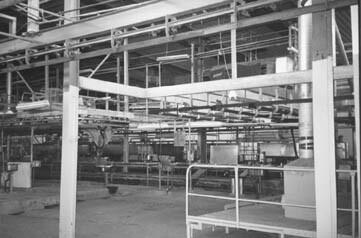 227		Horizontal Screw Conveyor, 40'x 12". 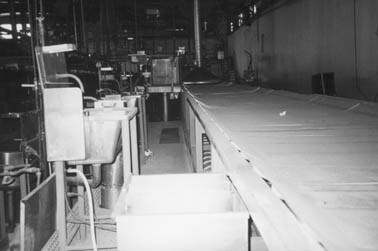 228		Elevating Screw Conveyor, 40'x 12". 230		"Barnes" Automatic Feed Meat Slicer. 231	2	Mild Steel Blood Tanks. Fluorescent Lights, Steel Clothes Locker. 236		"Conditionaire" Air Curtain, 5'. 240		"Werner" 10 x 10 Reciprocating Ammonia Compressor. 241		"Werner" 10 x 10 Reciprocating Ammonia Compressor. 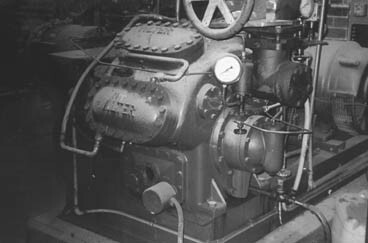 241B		"Budge" 6 Cylinder Refrigeration Compressor, 40hp. 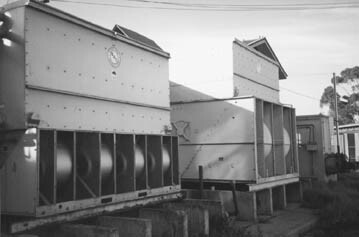 243		"BAC" Evaporative Condensor, Model VXCN205. 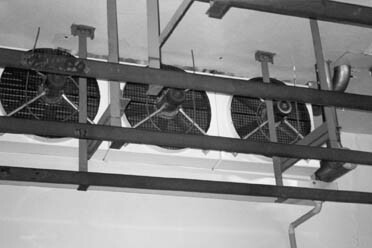 244		"BAC" Evaporative Condensor, Model VXC135. 245		Evaporative Condensor, Approx 100 Ton. 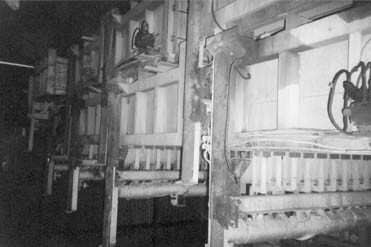 246		Evaporative Condensor, Approx 100 Ton. 247		"W & S" Evaporative Condensor, 150 Ton. 248		Ammonia Receiver, 12'x 4'. 249		Ammonia Receiver, 12'x 2'6". 249A	6	Canteen Tables, 8'x 4'. 249B	18	Steel Clothes Lockers. 251	22	Assorted Tables with Bench Seats. 252		"EGA" Stainless Steel Oven, 6'x 2'6". 253		Sink, Pie Oven, Refrigerator. 255	51	Steel Clothes Lockers. 256	78	Steel Clothes Lockers. 257	19	Steel Clothes Lockers. 258		FDC Unit, Single Fan. 24". 258A		Stainless Steel Mobile Stretcher. 261A		Assorted Clothing, Trousers, Jackets, etc. 261C		Steel Shelving and Pigeon Holes. 261D	5	Steel Filing Cabinets, 4 Drawer. 263		Saveall Scraper, 20' with Pump, etc. 264		Adjustable Small Stock Race. Rails, Pipe Gates, Mesh Over Timber Floor. 266	2	Galvanised Cattle Forcing Pens, Below Lairage. with Black Iron Pipe Race to Cattle Shed. 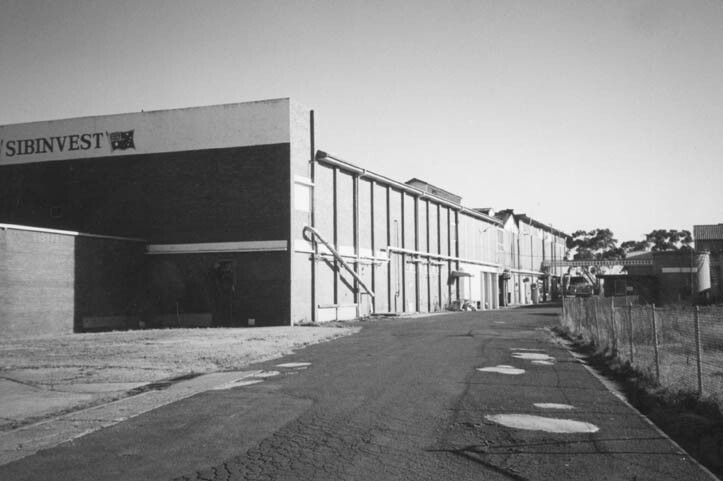 Corrugated Iron Roof, Pipe Pens Under. 277		Mild Steel Tank, 20'x 5'. 278		Mild Steel Tank, 20'x 5'. 100hp - 1hp - CAST IRON PIPE - 4 "SEMAK"
PLATE - "HOBART" DERINDER, ETC, ETC. 301		Butchers Bandsaw, 15" Throat. 302		"Hygenic" Bandsaw, 12" Throat. 303		Enamel Refrigerated Display Unit, 3'x 2'. 304		Stainless Steel Deep Freezer. 305		Stainless Steel Gas Stove, 6 Burner. 307		Stainless Steel Mobile Char BBQ, 24" x 24". 308		Stainless Steel "Hobart" Glass Washer, 18". 308A		Stainless Steel Showcase - Servery, 15'. 309		"Conditionaire" Air Curtain, 48". 310		"Conditionaire" Air Curtain, 36". 311		"Conditionaire" Air Curtain, 48". 312	2	"Conditionaire" Air Curtains, 24". 316		"Senak" Stainless Steel Rotisserie, 36". 316A		"Senak" Stainless Steel Rotisserie, 36". 316B		"Senak" Stainless Steel Rotisserie, 48". 318		"Risco" Sausage Filler, Top Load. 318A		Stainless Steel Clad Mincer, 3" Throat. 318B		Mobile Bain Marie, 48" x 18". 319	3	"Quell" Hose Racks. 321	2	Motorised Centrifugal Pumps. 322	6	Electric Motors and Gearboxes. 323		"Flygt" Submersible Pumps, 3". 324	2	"Crofts" Reduction Gearbox. 325	6	Fans 30" and Motors. 326		Pallet Pipe Fittings, Valves, etc. 330	2	"Charles Hunting" Variable Speed Motorised Drives. 331		"Bonfigliolo" Transmission Drive, 37kw and Motor. "Crompton Greaves" 4kw Electric Motor. 334		Crompton Parkinson" Electric Motor, 50hp. 335		Electric Motor, 30hp Approx. 337		Motorised Chain Drive, "Radicon" Gearbox. 338		"ASEA" Electric Motor, 60hp Approx. 12" x 12" x 6'. 340		Aluminium Expanded Meash and Checkerplate. 341		"WEG" Electric Motor, 75hp. 342		Motorised Chain Head, "Radicon" Gearbox. 343		Motorised Centrifugal Pump, 3", 20hp. 344		Motorised Centrifugal Pump, 3", (no Motor). 345	3	"Lennox" Heat Pumps, Model CPH15. 345A	3	"Lennox" Heat Pumps, Model CPH15. 345B	3	"Lennox" Heat Pumps, Model CPH15. 347		"ACI" Poly Tank, 5'x 4'. 349		"Fesca" Heavy Duty Reduction Gearbox. 352		"Alfa Laval" Decanter, Model NX309. 352A		"Hobart" Cyber-Tig Electric Welder, Type CT300. 353		"Anderson" Stean Cleaner, Model HPH20. 356		Electric Motor, 40hp Approx. 357		Butchers Segmented Chopping Block. 358		Butchers Segmented Chopping Block. 359		Butchers Segmented Chopping Block. 360	75	Poly Meat Trays, 15" x 12". 361		Vertical Air Receiver, 4'x 18". 362		"Visy Board" Lidder with "Nordson" HM Gluer. 363	4	Rams, 6' Stroke. Control Switches, Valves, Motors, etc. 367		PALLET - 3 Motorised Reduction Gearboxes. 369		PALLET - 4 Electric Switchboards. 373		Bleed Chain Vertical Drive. 374	2	Reduction Drives, 2 Electric Motors. 375		Pallet Electric Motor Drives, etc. 377		Pallet - 3 Motorised Fans, 30". 378		Centrifugal Pump, 4" x 2", Approx 5hp. 379		Pallet - 3 Reduction Drives. 383		Stainless Steel Table Frame, 4' x 4'. 384		Stainless Steel Table Frame, 4' x 4'. 385		Stainless Steel Table Frame, 4' x 4'. 386		Stainless Steel Table Frame, 4' x 4'. 387		Stainless Steel Table, 9'x 5'. 388		Stainless Steel Tub, 6'x 2'x 12'. 389		Stainless Steel Bench, 9'x 3' with 2 Sinks. 390		Stainless Steel Bench Top, 9'x 3'. 392		Stainless Steel Topped Table, 6'x 4'. 393		Stainless Steel Bench, 4'x 2'6". 395		Stainless Steel Topped Bench, 9' x 5'. 395A		Stainless Steel Tub, 3'x 2'. 399	2	Stainless Steel Sinks. 401		Stainless Steel Trolley, 3'x 2'. 402		Stainless Steel Mobile Bin, 4'x 2'6" x 2'. Mutton Dressing Chain Carcase Hangers. 404		Stainless Steel Mobile Bin, 4'x 2'6" x 2'. 405		Stainless Steel Mobile Bin, 4'x 2'6" x 2'. 406		Stainless Steel Mobile Bin, 5'x 4' x 3'. 407		Stainless Steel Hanging Tree, 5'. 408		Mobile Wire Bin, 6'x 3'x 3'. 409	2	Aluminium Checker Plate Stands, 12'x 5'. 410		Auto Blow Pot, 250kg. 411		Pallet Bread Baking Dishes. 413		Pallet 2 Exhaust Fans. 414		Pallet 3 Exhaust Fans, 30". 415		Pallet 3 Exhaust Fans, 30" & Exhaust Fan, 12". 416		Pallet 3 Exhaust Fans, 30". 417		Pallet 2 FDC Units, 6'. 418		Pallet 2 FDC Units, 30". 419		Pallet 4 FDC Units, 30". 420		Pallet 2 Exhaust Fans, 30". 421		White Belt Conveyor, 4'x 12". 422		White Belt Conveyor, 2'. 423		White Belt COnveyor, 3'x 12". 425		"Atlas Copco" Aftercooler, Type TO-8. 426		Pallet - Auto Carcase Scribing Conveyor and Saw. 427		Pallet - Shade Cloth. 428		Pallet - Pneumatic Items. 429		Pallet - Corrugated Aluminium Sheeting. 430	10	Galvanised Tub Trolleys. 431	6	Galvanised Tub Trolleys. 432		Assorted Belt Covers, Box Frame. 433		Ducted Air Conitioner.Box Frame.